I am hoping you might pass on some goings on down here in your group! 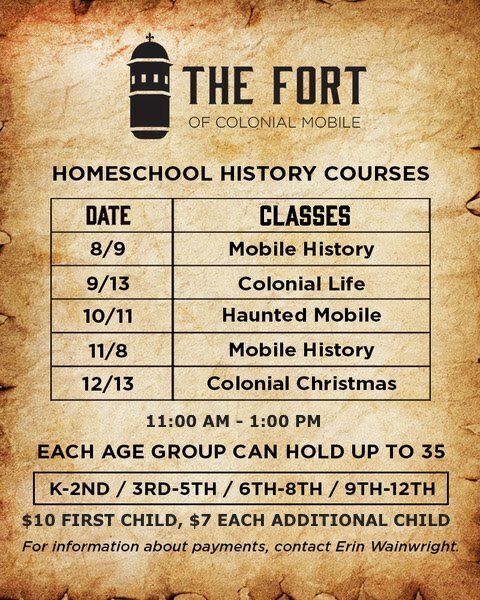 These are available to all area homeschoolers! University of Mobile FALL KICK OFF!! We need a BIG CROWD to show our BIG SUPPORT of this program! We will be announcing ALL the FALL workshops and opening sign ups! Presentation of the homeschool scholarship will be done this night as well! Finally there will be information on the new Freshman Academy program that gives your highschooler a FREE COLLEGE COURSE as well as what you need to be doing to get your child's records together to get them college bound! This is a FREE event so come and enjoy some time out with your fellow homeschool families! 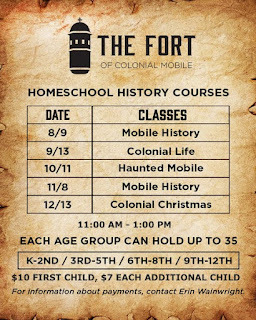 2nd up ~ is our new History classes at Fort Conde. I am just going to attach the flyer they made and if you will just tell people to contact me at South Alabama Homeschooling (Facebook page)! Oh there is ONE more event! There is a kick off skating party on August 8th at 10am at Dreamland Skate Center. They actually have a link to the event on their public page.